To my shame I have had this languishing in my watch box for a while. I was given it by Al when the new forum moved over to V-Bulletin for making an effort with my galleries, a competition prize if you will, and a most generous one at that. So thanks Al, I certainly owe you one. The sense of guilt at actually winning something has meant that I always intended to offer this as a charity auction piece on the forum, and I still might, but I wanted to share my burgeoning admiration for the layout of this piece. The dial is a lovely brushed dark navy blue (which I have failed to capture - I may have to give it to Gary for photographing properly ), its sobriety somewhat accentuated by the more garish 70's colours chosen for the calendar wheel. It still manages to be very legible, despite the "crowding" of the dial. I have had the crystal replaced (the original was crazed) and that took a lot of effort as the outer ring requires a special chamfer not present on any generic crystals. So a new one had to be custom made. You can see the tachymetre looks like it extends all the way to the case, and that the crystal looks like it has no sides. Very cool. About the only reason this is not a loved item in the collection is that it is a base metal case, plated, and not stainless steel. I still wonder why Wakmann would use such an expensive and competent movement, and shove it into a base metal case. Shame. Anyway, charity auction, keeper, or other? I think that's terrific, Dave, I would keep it. If you feel guilty about the gift, you could always make a seperate donation to a suitable charity such as Gary's bike/new watch fund? I also like your new Tissot - sorry I haven't said so yet. LOL, just pulled out my Lemania version of this watch (finally!) to shoot some photos last weekend! Will add them to this thread soon. I've had a time picking out a strap for this one. Right now it's on gray leather, but it's not quite right. Anyone? Hmmmm, interesting. 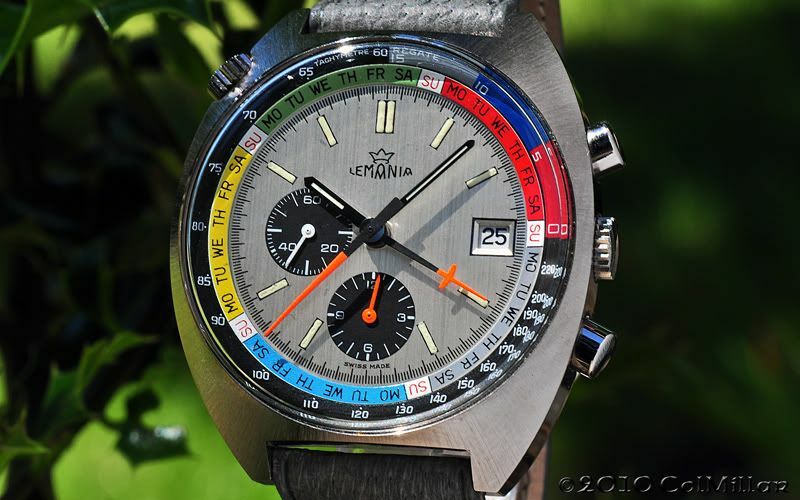 I don't think I have seen a Lemania one of these, does it have a calendar ring, or are we talking about a Lemania version of the Sinn 140/1/2, like this? I am also keen to try the Di-modell pilot, which is a simplified (and lower cost ) version of the Chronissimo. Bring on the photos Colin - go for it. It would be interesting to see a side view - I think I see what you mean about the crystal - very nice! 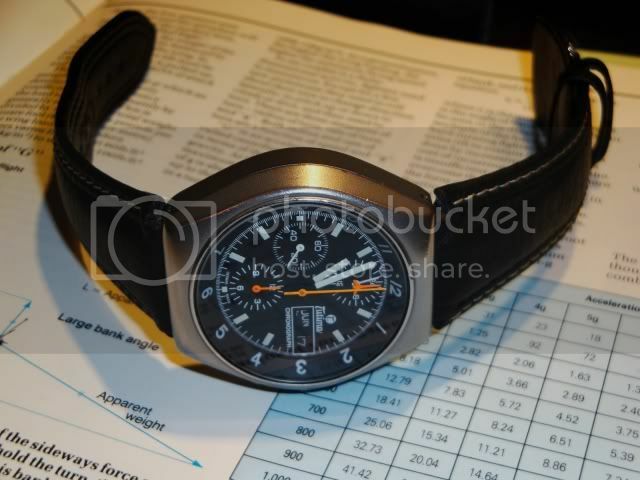 I have just popped the caseback on mine, (marked externally - SWISS MADE INCABLOC STAINLESS STEEL BACK ANTIMAGNETIC). It is clearly marked Wakmann Watch Co on the rotor of the 1341 movement and on the inside of the caseback (not the outside). Which is a shame - it would have been nice to see the original Lemania watch that dial came from. I suggest the hands are also a little late for the movement (if indeed the movement remains as a 1341 and hasn't been transplanted like the dial. The blue dial is just fantastic especially when combined with these ''Beyond the realm of Cool'' orange hands! As you suspected Dave, it says "Wakmann" on the inside of the back (sounds like our casebacks are identical) and the movement is a Wakmann 1340, though the rotor is unsigned and I'm making an assumption based on the Helvetia cross with the "W" inside. Just as a question, that's not a more "iron" shaped cross with LWO in it, the L and O in the arms, W in the centre?